Send your children back to school this fall with stylish new pencils and a cool case to store them in. 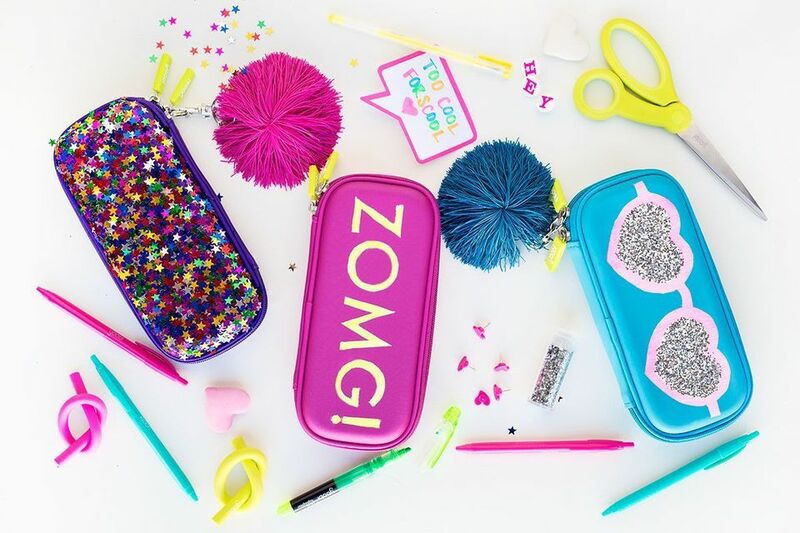 Start with this fun and colorful DIY: Update an old pencil case with one of these free printable stencils and use paint or glitter to stencil on the design. Give your pencils the royal treatment with little splashes of gold. Pick pencils in a color you like paired with shimmery metallics, like the pink chosen here or go with black for a bold statement. This very simple DIY is great for beginners. Simply recycle a piece of scrap fabric to create a basic case to hold all of your supplies. It's cheaper than buying a fancy case at the store (plus, you can customize the pattern!) and no sewing is required. Help your kid always have a bunch of sharp pencils within easy reach on their desk for when they are working on their homework by using cut pieces of vinyl to craft a modern apple pencil holder just like Damask Love. Head to the dollar store and grab a blank canvas pencil case and just like Almost Makes Perfect and have your child use fabric paint to stamp a design all over the canvas so they can have their own personalized pencil case to use at school this year. Instead of the standard orange pencils, Make and Tell shows how to make your child a set of multicolored confetti pencils for them to use at school this year by painting standard pencils with confetti dots. 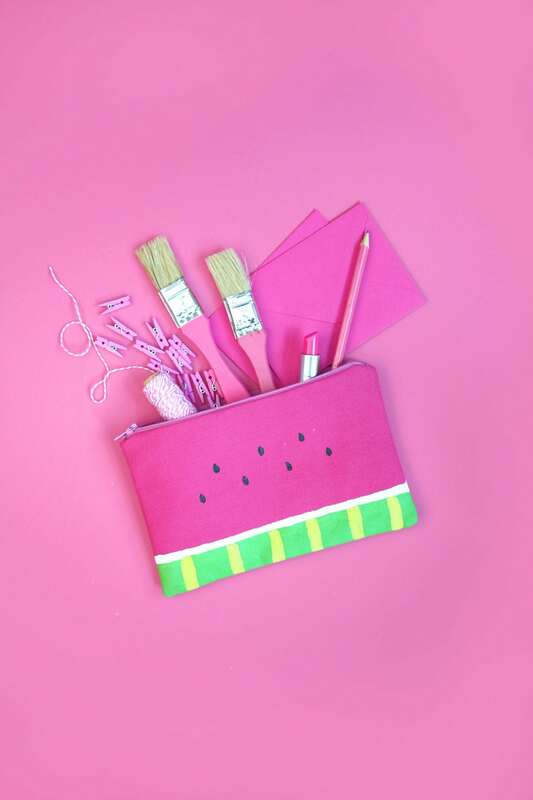 With a little stitching skills you can whip up this pretty pencil case just in time for back-to-school. Add some floral motifs or get creative and design your case any way you'd like! Keep the summer vibe lasting all school year with a tropical themed palm leaf pencil pouch. Persia Lou has a free palm leaf template that you can use to cut a stencil out of vinyl and paint the design onto your fabric pencil pouch for an easy back to school DIY that you can make tonight. Instead of buying a set of patterned pencils, make your own by applying the patterned temporary tattoo designs by Maritza Lisa around the top of each pencil to apply craft a set of beautiful pencils for your children to use for school this year. Help your child start the school year off right by organizing their school supplies in a new clear pencil case with trendy gold dot detailing as made by Sarah Hearts so that they can keep all their school work essentials, such as pencils, a ruler, scissors, eraser, and markers all together so they can be easily found. Gold still remains as a trendy choice, so help your teenagers heading to high school or college this fall by surprising them with a set of chic gold pens ?for them to use to jot down all their notes in class this fall just like the ones made by Enthralling Gumption using regular pens and gold contact paper. From coloring presentation boards to art class students from elementary school throughout high school will need their own set of coloring pencils for projects in the school year. The Merrythought designed a spectacular DIY leather coloring pencil holder that individually holds each color so they can be quickly found upon unrolling the case. Do you have tons of leftover rolls of washi tape around the house from previous DIY projects? Grab a pack of pencils and some of your favorite washi tape rolls as done by Stephanie White and begin wrapping regular pencils to give them a brand new look for your kids to use this year at school. Each pencil takes less than a minute to make, and this project can easily be done by older school age children to make their own pencils. Add a splash of color to Ikea's rattan pencil cases just like Delineate Your Dwelling by masking off areas with painter's tape and painting the pencil case with your child's favorite colors to give them a spot to store pencil, crayons, and erasers. Does your child always seem to lose their pencils at school? Help them identify their pencils by giving them a set of personalized pencils that can be made using the variety of pencil label designs available at Lia Griffith, which you can customize with your child's name before printing the design that can be wrapped around a regular pencil. Damask Love has designed three adorable fruit pencil cases including strawberry, pineapple, and watermelon which you can make by updating regular blank fabric pencil cases with faint and green felt to craft a new pencil case, while each design is painted slightly differently all are easy to make. So get painting, and paint some strawberry seeds to make your child a new pencil case for them to use when they head back to school this fall. Recycle a mail tube used to send packages in the mail by turning it into a pencil case perfect for storing school supplies such as markers, pencils and pencil crayons. Just like Damask Love you can use decorative paper to cover the mail tube with a pattern in your choice of colour, such as the black, white and pink design of this handmade pencil case tube. Surprise your teenager with a bouquet of handmade flower pencils for them to use at school by attaching an artificial flower to the end of a regular pencil just like Consumer Crafts did. When the flower pencils are not in use, they can also make a lovely way to decorate a desk if they are stored in a pencil cup, as it will look like an arrangement of flowers. Teach your kid some basic sewing skills by working with them to create their own pencil case to use this school year by weaving cording through white canvas mesh just like Lovely Indeed did to make a simple pencil pouch. The simple weaving with cording is easy to do, and the same technique can later be applied to your child later on when they wish to learn how to do basic sewing.